[Newsmaker] Was Park Geun-hye asleep while Sewol ferry was sinking? Enraged responses are flowing from political and public circles after the prosecution concluded Wednesday that former President Park Geun-hye spent crucial time on the morning of the Sewol disaster in her bedroom. The 2014 Sewol ferry tragedy, which killed 304 people -- most of whom were school children on a trip -- is considered one of South Korea’s deadliest disasters. More than half of the survivors, some 170 of them, were rescued by private fishing boats and commercial vessels, not by the nation’s coast guard. The prosecution on Wednesday announced that four former aides of the now-ousted Park had been indicted for abuse of power and document falsification. The authorities believe the aides, including Park’s former chief of staff Kim Ki-choon, deliberately fabricated the time Park had first been informed of the disaster, changing it from 10:20 a.m. to 10 a.m., as part of efforts to conceal her slow response on the morning the tragedy occurred. The last KakaoTalk message from one of the victims in the ferry was sent at 10:17 a.m., and authorities believe by the time the former president was finally briefed on the accident at about 10:20 a.m., the situation had already been unrecoverable -- making any rescue operation no longer possible. While the prosecution concluded the former president was in her bedroom on the morning of the disaster, it is still unclear what she was doing in her room at the time, as well as the exact reason behind her inaction. The former President’s whereabouts on the day of the Sewol tragedy had been a controversial topic even while she was still in office. In spite of repeated public demands, the presidential office at the time refused to provide a clear explanation of why she had not been briefed in person on the accident for about seven hours, until she showed up at the disaster control center at about 5:15 p.m. Her staff at the time only insisted she was attending to “official duties” at her residence in Cheong Wa Dae on the morning of the disaster. They did not offer any additional information, despite the families’ demands for details on what Park was doing for the seven hours on the day of the ferry’s sinking. Rep. Woo Won-sik, the ruling Democratic Party’s floor leader, said the prosecution’s announcement -- that the time log had been deliberately fabricated -- is both “shocking and enraging.” He also demanded that the Liberty Korea Party, of which the former president used to be a member, should apologize to the victims’ families. But the main opposition Liberty Korea Party initially said in response to the prosecution’s probe that it “feels sorry” for the ex-president and she does not deserve the amount of criticism she is receiving for her handling of the disaster. The party later retracted its statement and apologized for Hong’s remarks in the face of mounting criticism. Victims’ families, on the other hand, demanded the former president’s public apology. 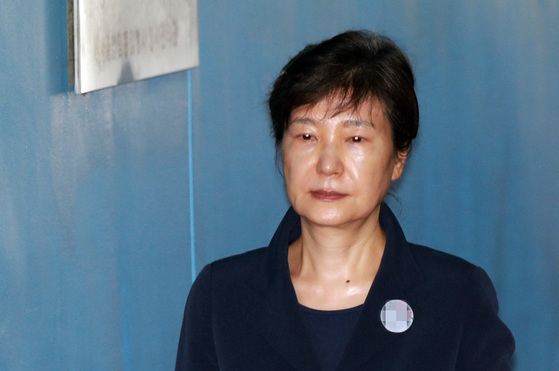 Some have suggested that Park may have been asleep in her bedroom on the day of the ferry incident, as documents show the former president may have suffered a sleeping disorder. According to ruling Democratic Party lawmaker Kim Sang-hee’s office, Cheong Wa Dae had purchased about 600 tablets of Circadin, a sleeping drug often used to treat patients in their late 50s or older with insomnia, in November and December of 2015. There is no record of the presidential office purchasing any sleeping drugs in 2014, the year the ferry disaster took place. They speculate that Park had suffered insomnia throughout 2014, including on the day of the ferry incident, and finally decided to receive treatment in late 2015. As her staff failed to provide a solid explanation for what she was doing as the ferry was sinking, Park became the subject of online attacks and rumors that year. For one, a Seoul-based, Japanese reporter published a column accusing her of having an affair with an unknown lover at a five-star hotel on the day of the disaster. Other rumors claimed her participation in cult worship or of receiving a cosmetic procedure, among others. The former president never offered an apology on the specific matter, nor sought to explain properly. Park was impeached last year in a dramatic corruption scandal, and has ceaselessly maintained her innocence while facing 18 charges, including abuse of power and bribery. She has refused to attend any of her hearings and did not appear in court when prosecutors requested 30 years in prison for her in February. Earlier this month, she also refused to be interrogated by the prosecution on allegations her staff lied about the time at which she was first briefed of the sinking of the Sewol.